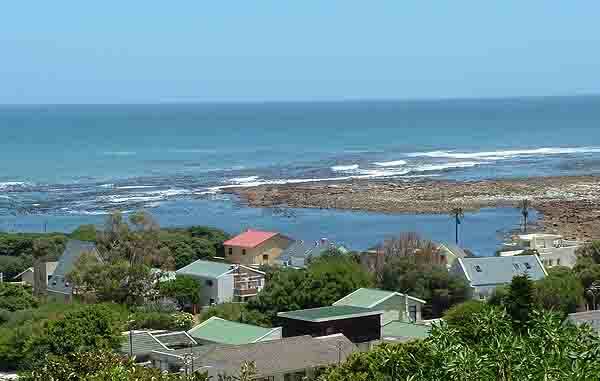 Kommetjie a small village situated on the Atlantic coast of the Cape Peninsula has once again been in the news. Unfortunately it had to be a tragedy that got it its headlines when five people drowned after a boat capsized off the Slangkop Lighthouse. The Kommetjie coastline is very dangerous and boats often get into difficulty because of freak waves. Over the years a number of ships have run aground along it and one wreck that is still visible is the Kakapo. 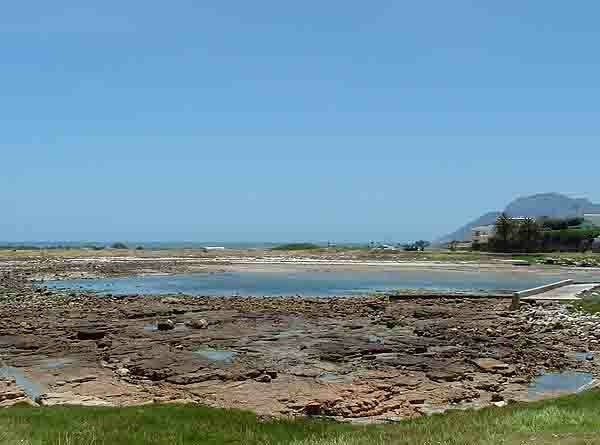 The rocky coastline around Kommetjie is made up of a number of small bays the first of which is named "The Kom" and is the one from which the village gets its name. Kommetjie has a number of things going for it. Firstly it has a number of well known surfing spots two of them being the Inner Kom and the Outer Kom. The Inner Kom works well when the tide is up and especially at spring tide when the waves breaking over the reef that guards the entrance to the bay rush in and sweep down the rocky coastline. The outer Kom has very large waves and when the sea is rough these waves can be very dangerous as many a surfer has found out when his board has been smashed in two and he has had a very long swim to get back to the shore. A number of small crayfish boats are stationed in the inner Kom and have to negotiate a channel in the reef to get out to the open sea. If the sea is calm there is no problem getting out of the bay but as the tide comes up the south east wind begins to blow and the waves pick up making a return trip into the bay extremely dangerous. A number of boats have capsized in the channel over the years and people have drowned. The inner Kom is home to a number of kelp beds and in turn they are home to the crayfish which abound along this coastline. On weekends during the crayfish season you will often see men with their fishing poles standing on the rocks fishing for them. Limpets and other mollusc type shelfish provide a ready supply of bait. Moving northwards along the coast the next little bay we come across is an extension of the inner Kom. It was once a tidal swimming pool which after a springtide was so full of kelp and rubbish that it could not be utilised to swim in. The authorities had difficulty cleaning it out so decided to break the pool wall down to allow the tide free access into the pool so it could be freshened up when the tide came in. The floor of the pool is quite interesting in that it is home to some of the biggest pink prawns I have seen. To preserve them the authorities have banned prawn pumping. Also found in the floor of the pool are some lovely clay beds where if allowed potters could mine their own clay. To the west of the pool is an area which is called the island. Before the lawned area near the carpark where fishing boats park was established there used to be dunes and when the sea was really rough during some of the winter springtides it would rush through this area and turn the island into a real island. Kommetjie has always been a fishing village and the next little bay is the one utilised by fishermen to launch their boats. Boats are towed from the parking area over the sandy beach to reach the water where they are launched. The launching site was once filled with thousands of rocks but fishermen and the authorities have over the years moved then aside to establish a channel for boats to gain access to the sea. Close to the sea entrance to the channel is a large rock called Black rock. It looks like a meteorite and has a surface that is burnt and pockmarked. This rock is different in appearance to anything close by and in my opinion is alien to the area. Researchers however say it is not a meteorite. The rock however has become home to many shellfish including crayfish which hide in its many crevices. Another interesting feature in this bay is that it has a number of different types of kelp growing in it. One especially is a problem to fishermen and is named "Klokkies Bamboo". It has long roap like strands which have bell shaped appendages which float on the top of the water. This kelp is found near the centre of the bay where waves often break and fishermen set their crayfish nets. Often when fishermen are not watching the sea a freak wave will break over the nearby reef and will capsize the small fishing boat landing the fishermen in the floating Klokkies Bamboo. As most of the local fishermen cannot swim they struggle when landing in this kelp and it curls around them and eventually drags them down and they drown. Moving northwards the rocky coastline is left behind and one arrives at the longest sandy beach on the Cape Peninsula's Atlantic coastline. You've guessed, its name is Long Beach. It's one of Cape Town's favourite surfing spots. 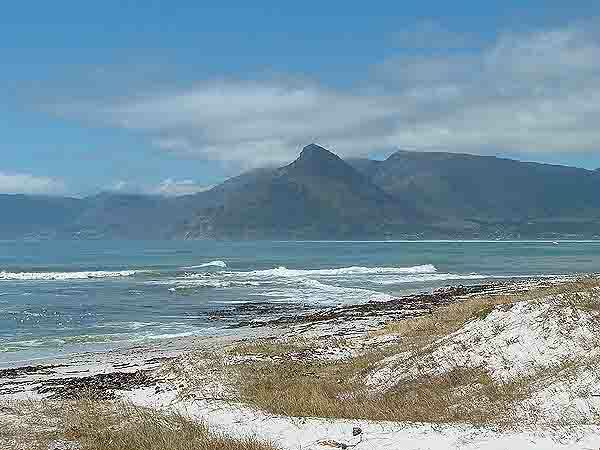 When the south east wind wipes out the surf along the Muizenberg coastline Long Beach comes into its own. The wind whips up the waves and cleans up the surf allowing surfers to sometimes ride in the pipeline when the waves break. The waves are known as dumpers to the locals and many an unsuspecting swimmer has been dumped when caught in the curl of the wave. After being caught in the curl you are thrown backwards onto almost dry ground and then the wave lands on top of you and rolls you up onto the beach. It's painful and can be rather embarrassing if your friends are watching. Long Beach continues northwards for a number of kilometres before reaching the cliffs of Chapmans Peak. 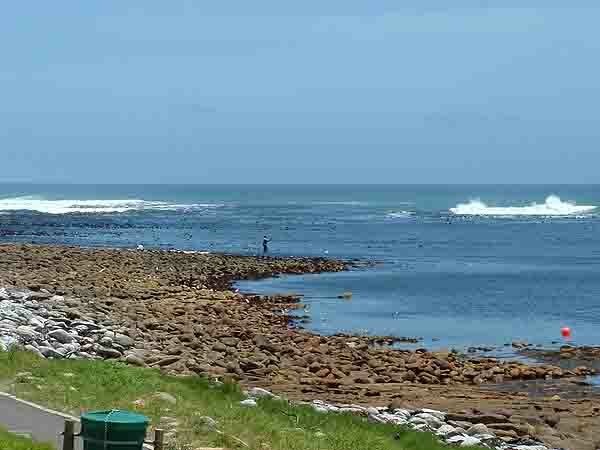 Over the years Kommetjie has become very popular with people wanting to stay close to the sea and has expanded in all directions. What used to be a small village has now become a rather large village. Even though there has been this influx of people Kommetjie has kept its village atmosphere and still remains an interesting place to visit and explore. For those who enjoy history a number of the original stone houses built are still standing. The old stone building near Slangkop Lighthouse which was used by Cape Town Radio during the war years is today used by the Department of Fisheries. Slangkop lighthouse the tallest cast iron tower along the South African coastline is 92 years of age and is open for those who are interested in climbing to the top of the tower. The views from the top are quite spectacular. High above the lighthouse on the mountainside are a number of stone lookout buildings which were used during the war to spot enemy shipping. A short climb to the top will give one access to some more spectacular views over Kommetjie and to Hout Bay and Chapmans Peak in the distance. Kommetjie once boasted two hotels, one is still open and the other is been utilised for other purposes today. Way back in the 1950's tour buses on their way to Cape Point used to stop over and guests would have lunch at the hotels. Today for some strange reason tour operators ignore this historic village and turn off to Cape Point at Ocean View thus robbing visitors of some stunning views. That however should not stop you from stopping off and enjoying some time on the beaches and walkways along this stunning piece of the Cape Peninsula's coastline.